A gift, given in honor of long-time Emory Healthcare employee Roxann Arnold, will benefit patients and their families with serious illnesses. 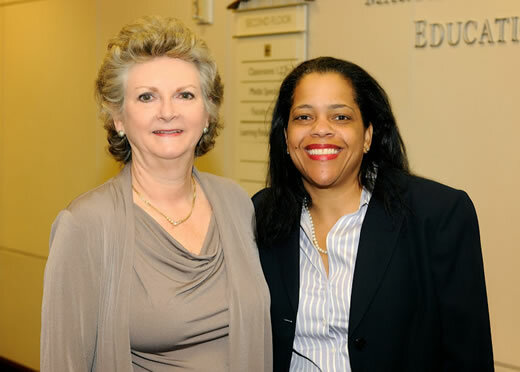 The gift, given by an anonymous donor, will create the Roxann Arnold Professorship in Palliative Care Medicine – appointed to Tammie E. Quest, MD, director of the Emory Palliative Care Center. Palliative care is specialized medical care and support for patients with serious illnesses and their families. Doctors, nurses, chaplains and other specialists work as a team to provide coordinated care that improves longevity and quality of life, regardless of the stage of the illness. Arnold, who has held the position of director of patient financial services for Emory hospitals for 37 years, introduced the donor to the concept of palliative care while talking about their own aging and infirmed families. "I love the opportunities I have to interact with patients and their families and to help them work through the often daunting maze that is health care," says Arnold. "This donor and I have had many conversations about health care and the facts that the clinical and social support is in such tremendous need by our ever aging population who become ill and turn to palliative care services for assistance. " Arnold, and her team of more than 130 employees, manage billing and collections for all of Emory's hospitals, infusion centers and cardiac outreach areas, while working closely with colleagues at the many Emory Clinic locations. Quest, who is being awarded the named professorship, is a nationally recognized expert in palliative care. She is an associate professor in the Department of Emergency Medicine and director of the fellowship program for the Emory University School of Medicine program in Hospice and Palliative Medicine. "This gift speaks volumes to the importance of all people within our health care system in caring for patients and families," according to Quest. "Roxann made an incredible impression on this donor, detailing her commitment to Emory, the vision of palliative care for our patients and families and the importance of the standards of quality and care for seriously ill patients. We all play a role in the care of our patients, even in non-direct clinical care settings, such as Roxann's." "This is a monumental gift that will help in transforming palliative care at Emory by supporting the leadership of the center," says Quest, who also holds a faculty appointment at the Emory University Center for Ethics, because of her strong interest in ethics and end-of-life care. "The funds will support new care models for our outpatient programs and hospitalized-based care to push Emory forward in becoming a national leader in the field of palliative care." Arnold says she is honored to be a part of such an exceptional gift, and one that was unexpected. "What is really important to me is how this gift to palliative care will benefit an untold number of people through everyone that touches the patient. The gift will help Dr. Quest train health care professionals and apply the palliative care concept to patients and families." Quest remarks that this unique donation is a linkage gift — in that it combines business and health care finance on Arnold's end and clinical care on Quest's end. "When you put it all together, patients and families will benefit greatly because of these special links."